The five Peacock Class Offshore Patrol Vessels were ordered in 1981 to replace the ageing converted Ton Class Minesweepers as Hong Kong Patrol vessels. Built by Hall Russell in Aberdeen they were not unlike the Castle Class in design, although smaller, faster and better armed. They marked a significant improvement in capability over the vessels they replaced, being capable of operating in the Far East, outside local Hong Kong waters. 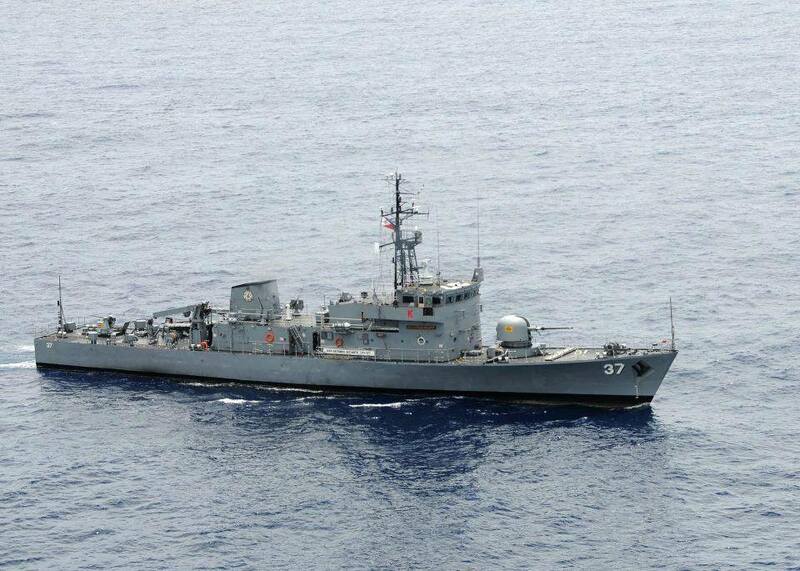 The class was designed specifically for patrol duties in Hong Kong waters. As well as ‘flying the flag’ and providing a constant naval presence in region, they could undertake a number of different roles including Seamanship, Navigation and Gunnery training and Search-and-Rescue duties for which they had facilities to carry divers (including a decompression chamber) and equipment to recover vessels and aircraft. They also worked with the Marine Department of the Hong Kong Police and with Customs & Excise in order to prevent the constant flow of illegal immigrants, narcotics and electronic equipment into the Colony. With a displacement of 652 tons, the Peacock Class measured 62.2 metres in length, 10 metres in beam and 2.72 metres in draught. Powered by two Crossley Pielstick diesels they had a speed of over 25 knots. The Peacock Class were the first warships fitted with the single 76mm Oto Melera Gun and they were also armed with four General Purpose Machine Guns and two rocket launchers amidships. For anti-smuggling and Search-and-Rescue operations they carried two Avon Searider SR5M craft and a small detachment of Royal Marines. Complement consisted of 6 officers and 38 ratings, of which half were usually recruited from the local Hong Kong Chinese population. For work in tropical climates they were fully air conditioned and capable of remaining at sea during Typhoons. 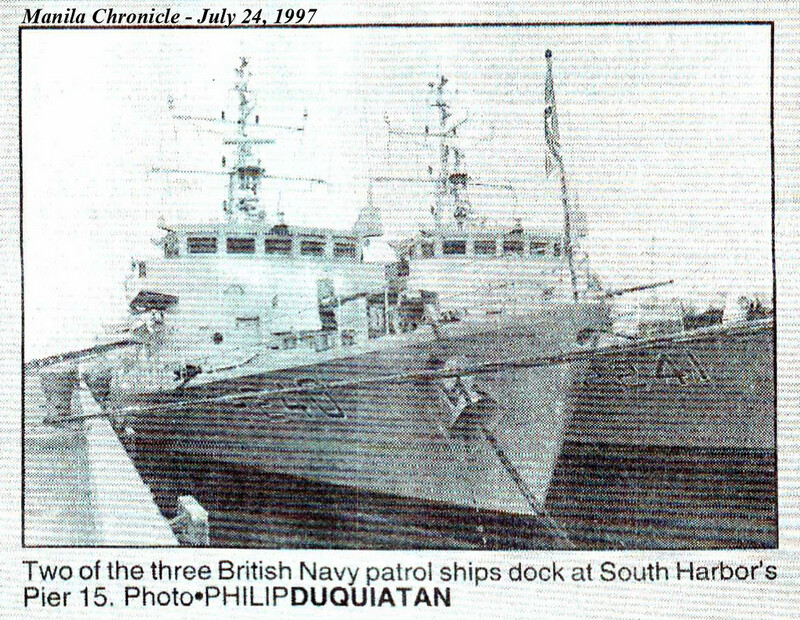 The video below shows the arrival of Royal Navy ship HMS Starling (P241) in the Philippines prior to its decommissioning on 30 June 1997. SUBIC BAY, Philippines (NNS) -- The 2004 edition of the Cooperation Afloat Readiness and Training (CARAT) exercise series ended Aug. 4 with the closing ceremony of the Philippines phase. CARAT is a series of bilateral military exercises held annually throughout Southeast Asia that began in 1995 by combining a number of existing exercises to be conducted sequentially by a single U.S. Navy task group. The CARAT Task Group ships arrived in the Philippines July 27 for the final phase of the CARAT series. CARAT Philippines included numerous milestones, including the presence of two of the most advanced platforms in the world - the Arleigh Burke-class guided-missile destroyers USS Russell (DDG 59) and USS McCampbell (DDG 85). The destroyers were key during at-sea tactical evolutions. Nearly 1,200 Philippine Navy and Coast Guard personnel, along with the five Philippine Navy ships and two aircraft are participating. 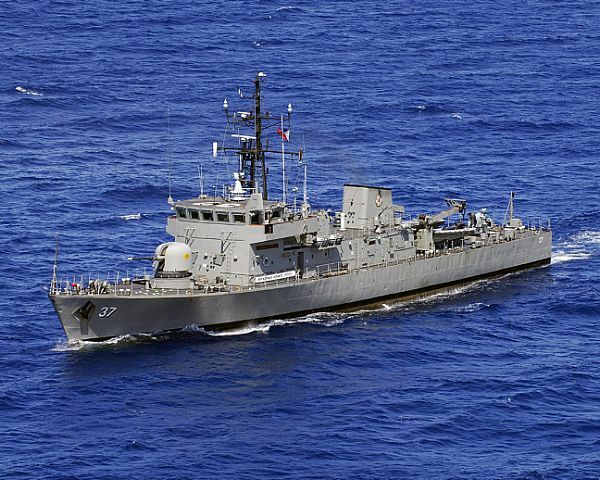 The ships include BRP Artemio Ricarte (PS 37), BRP General Mariano Alvarez (PS 38), BRP Lanao del Norte (LC 504), BRP Hilario Ruiz (PG 378) and BRP Alberto Navarette (PG 394). 8 - Jacinto Class Patrol Vessel (JCPV) Generators for the Philippine Navy. Eight other projects with a total project cost of P1,965.364 million are being implemented as of 2005. These are (1).. 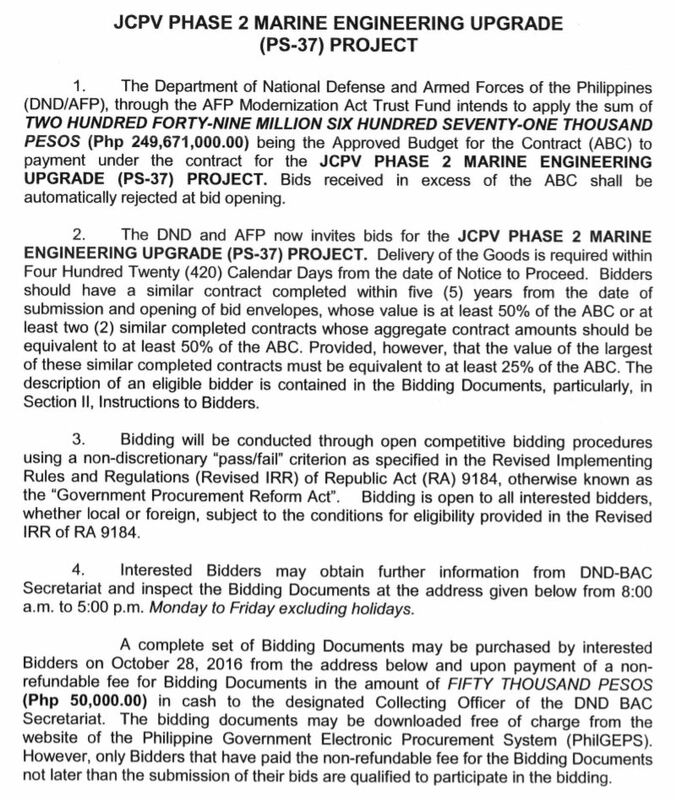 Similarly, the Jacinto Class Patrol Vessel (JCPV) Weapon System Upgrade is being undertaken through government-to-government contract with the United Kingdom. The project has been awarded to QinetiQ Limited of the UK. The upgrade would enable the three vessels to perform effectively a greater number and variety of missions. 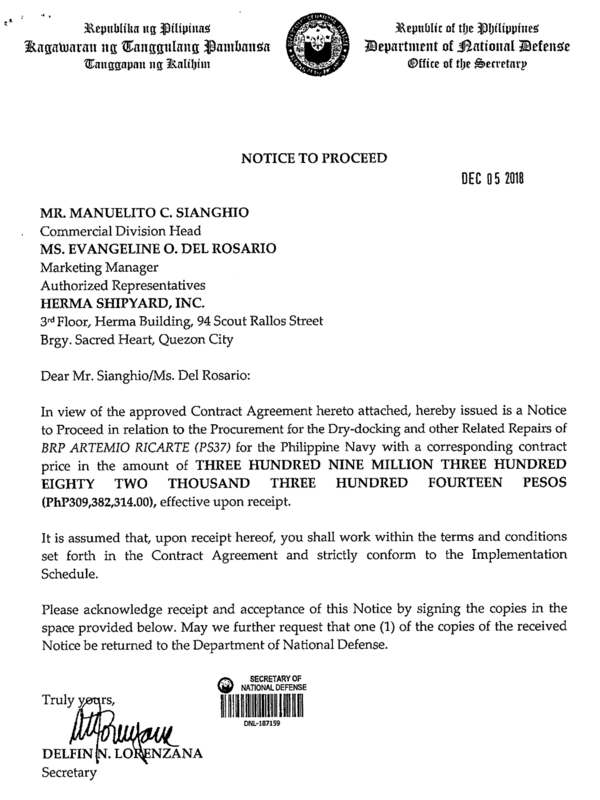 With the contract approved by the SND on 24 June 2003, the vessels are dry-docked at Keppel Shipyard in Batangas where 97% of spare parts have been delivered as of 21 December 2005. Estimated date of completion for all three vessels is on March 2006. SIBUYAN SEA (NNS) -- A maritime interception operations (MIO) training event kicked off Exercise Balikatan '06, a combined exercise between the United States and the Republic of the Philippines, Feb. 17. Twenty-three Filipino sailors from the frigates BRP Artemio Ricarte (PS 37) and BRP Rizal (PS 74) came aboard USS Curtis Wilbur (DDG 54) and joined their counterparts for training on visit, board, search and seizure (VBSS) tactics and procedures. The training is vital to both navies and is integral to fighting the global war on terrorism. Balikatan '06 is the 22nd annual exercise in the series and the exercise title itself means, "shouldering the load together." Its aim is to further develop the Armed Forces of the Philippines (AFP) in crisis action planning, enhancing its ability to effectively conduct counter-terrorism operations, and promote interoperability between the two navies. The exercise also emphasizes the cooperation and execution of humanitarian and civic assistance. MIO and VBSS were new additions to this year's exercise. "With the Philippine Navy Sailors we got the chance to train with, they quickly mastered the skills we taught them. Our guys showed them the techniques we use to do a boarding, but in the end, the actual practice boarding between the two teams was seamless." MANILA, Philippines (NNS) -- The first phase of the 13th annual Cooperation Afloat Readiness and Training (CARAT) exercise series ended June 8 with a festive ceremony in the multi-purpose hall at Philippine Navy Headquarters in Manila. "Together through nine days of exercises ashore and afloat, and projects benefiting the communities and people of the Philippines, we have reaffirmed the close bond and friendship our two countries share," said Collins, commander of Destroyer Squadron 1 and Task Group 73.5. "One of the goals for this year's CARAT, as stated by Adm. (William) Burke during our opening ceremony in Zamboanga, was to build upon the relationship our armed forces have developed since World War II. Well, I have seen that relationship continue to grow firsthand." CARAT allowed the U.S. and Philippine armed forces the opportunity to enhance practical skills in several tactical areas, including maritime interdiction and surveillance, search and seizure exercises, a mock amphibious raid, force protection, and diving and salvage operations. This combined effort extended to civic-action projects undertaken by the two nations in CARAT's first visit to Mindanao, where the exercise began May 31. Philippine assets included the Philippine Navy patrol ships BRP Artemio Ricarte (PS 37), BRP General Mariano Alvarez (PS 38) and BRP Quezon (PS 70), the Philippine Coast Guard vessel BRP San Juan (SAR 001), and four BN-2 Islander patrol aircraft flown by the Philippine Navy and Coast Guard. ^^^^So it's an upkeep not an upgrade. Keep it straightforward and honest. Some threads up, it went thru Phase 2 of Marine Engineering Upgrade last year. So, for awhile shafts were not aligned? If it happened right after the upgrade, should it be still under warranty? The bid for the upgrade was November 2016, so the job was completed either mid 2017? One year and 3 months of use and partially mission capable. That's wrong. Nope. The previous bids failed. This is yet another attempt to get this bid done. This is also separate from the dry docking bid that has reportedly already been awarded. Ok, because of the delays, it created more repairs to be done. 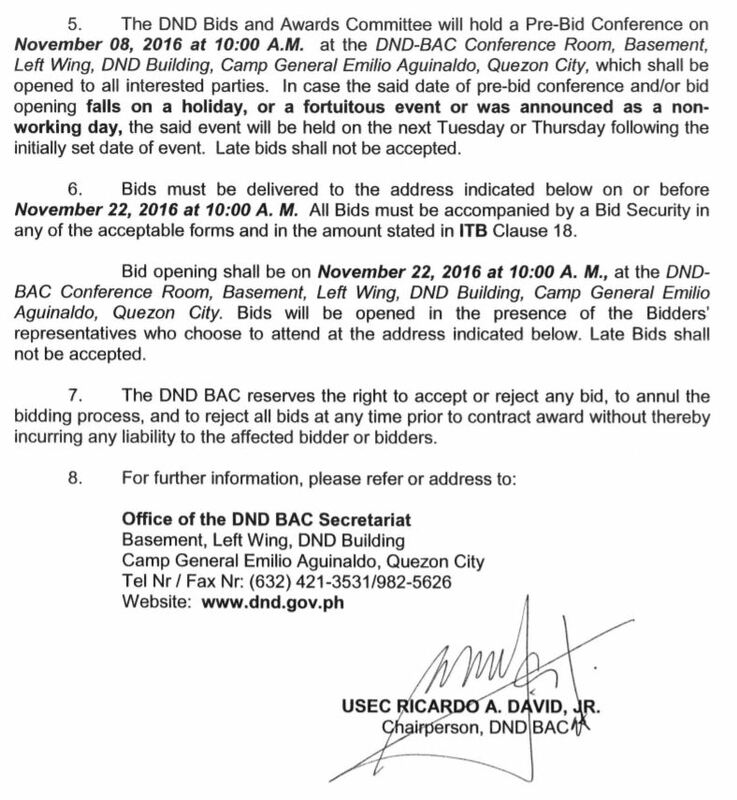 If this bid fails again, keep using it until .....I understand the need to be transparent (I hope) but this is not the way to maintain assets.